State of Transformation: Hybrid IT Progress Report from the perspectives of the IT executive and the IT practitioner. Organizations are accelerating their digital transformation efforts to keep pace with changing customer expectations. In the digital era, business innovation is highly IT-dependent, thus creating an expanded role for IT organizations in today’s enterprises. 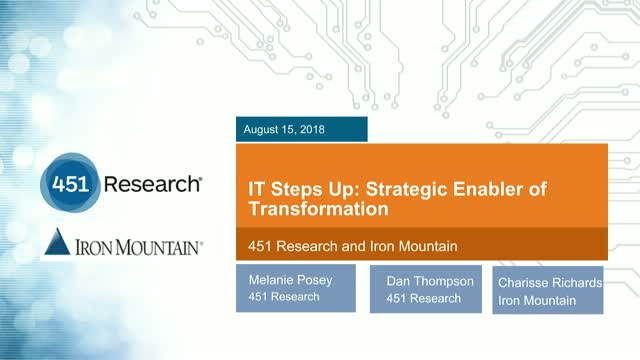 Forward-looking IT leaders are embracing the challenge, which entails not only the traditional IT task of “keeping the lights on” but also development and maintenance high-performance hybrid IT environments that provide the scale, speed and operational efficiency required to harness the potential of data and data-centric technologies to drive business value and competitive differentiation.